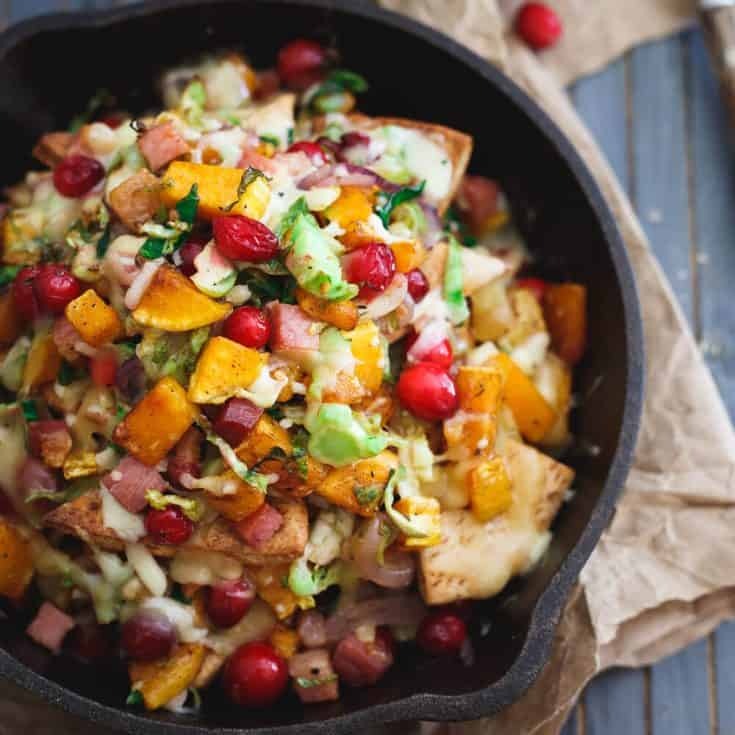 These butternut squash pita nachos bring a fall twist to the table packed with brussels sprouts, cranberries, pancetta and caramelized onions. I have a legit fear of cutting winter squash. Like full on convinced I’m going to lose my hand and my kitchen will end up looking like a scene from Dexter (minus all the plastic tarp so clean up would be a mess) with me screaming to myself and barely able to dial 911. This fear exists despite the fact that I got suckered into buying a “squash knife” (yes, such a thing apparently exists) from the Cutco lady who sat in my kitchen for an hour a couple of years ago with her sales pitch game on point when all I wanted was my free sharpening promised to me. Every time I look at that knife in the drawer I feel like I should plaster the word “SUCKER” on my forehead. The squash knife has done little to alleviate my squash cutting fears and so my solution lately is to just buy the smallest squash I can find in the bin at the grocery store. the likelihood of accidental extremity amputation is drastically reduced. you’re not left with half a squash you didn’t need for whatever it is you’re making that you now have to store in the fridge. the gross goopy seed area is much smaller. they’re super cute and the perfect size for things like these butternut squash pita nachos. When it comes to nachos, I actually prefer pita bread as the base rather than chips. Chips are great for dips and stuff but when you’re loading up nachos (and there really should be no other way to eat them as far as I’m concerned) you need something sturdy enough to handle all the toppings. Ain’t nothing worse than going in for that perfect bite only to have your chip break off half way through the pull. Am I right? Last month I got to visit the Toufayan factory in New Jersey and eat pita bread fresh off the line literally seconds after coming out of the oven. You guys, when we walked through the doors into the factory, it literally just smelled of carbs. Sweet, precious carbs everywhere. It’s kind of what I’d imagine heaven to be like if it exists. I’ve been a total fan girl of their whole wheat pita bread for years, especially this past year as I’ve transitioned to macro-based eating because they fit so well into my carb allotment. Doesn’t hurt that they taste delicious and come in so many varieties and sizes so it’s pretty much impossible to not find something you love. Meeting with Toufayan, a family owned and run company, felt like a family gathering of my own with sarcastic one liners being thrown out between brother and sister, the kids talking about dad and how crazy he is when he leaves the room but all with an undertone of love and dedication to their company which started over 90 years ago with the first bakery in 1926. We learned about the family passion for their quality products along with all the ways they give back to the community, which are extremely plentiful and generous. It made me happy to know the hundreds, if not thousands (literally!) of dollars I’ve spent on pita bread over the years was helping to support so many awesome causes. The weather shifted this past weekend and suddenly it’s very much fall outside. I bought pears instead of nectarines for the first time when presented with both at the grocery store, I’ve started craving afternoon tea (something I only do in the colder weather) and suddenly things like butternut squash pita nachos sound appropriate. Loading them up with brussels sprouts, pancetta, cranberries, caramelized onions and all.the.cheese doesn’t hurt either. 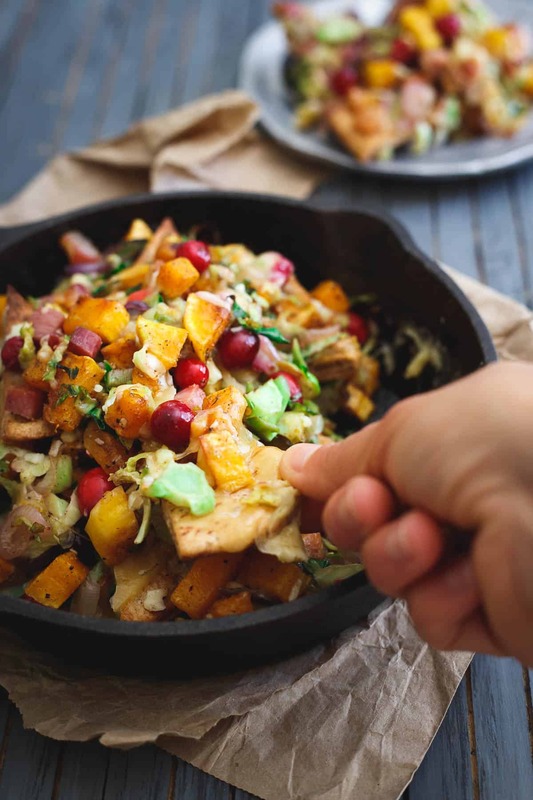 With pretty much every fall topping you can think of on these nachos, they definitely needed a pita bread base. While my usual go to is a simple lunch sandwich, my beloved Toufayan whole wheat pita bread also happens to make the perfect base for this fall nacho explosion. 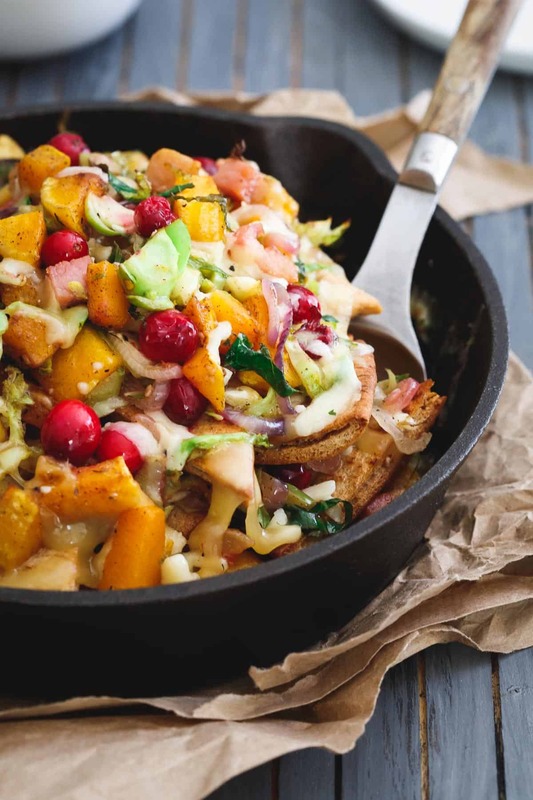 Sturdy for optimal nacho pull-age and hearty to stand up to those bold fall flavors in the butternut squash, cranberries and brussels sprouts. Place pita wedges on a baking sheet. Drizzle with the olive oil and season with the rosemary, salt and pepper. Bake for 8-10 minutes until golden brown and crisp. Remove from oven and set aside. Place a small cast iron skillet over medium-high heat. Once hot, add the pancetta and cook until fat is rendered and pieces start to crisp up. Transfer pancetta to a plate with a slotted spoon leaving the fat in the skillet. Add the butternut squash to the skillet with the cinnamon and season with salt and pepper to taste. Cook for about 10 minutes until softened and starting to brown/caramelize around the edges. Add the brussels sprouts, red onion, garlic, chili powder, red pepper flakes and more salt and pepper to the skillet. Toss to combine and continue cooking another 5-7 minutes until everything is softened and the squash is starting to break apart. Add the cranberries to the skillet and cook another 1-2 minutes until just heated through. Transfer the contents of the skillet to the dish with the pancetta. Place 1/3 of the pita chips in the bottom of the same skillet. Top with 1/3 of the cheeses then 1/3 of the vegetable mixture. Repeat 3 times until all the ingredients are used up. Transfer skillet to the oven and bake for 5-7 minutes until cheese is melted and gooey. Maple Bacon Wrapped Brussels Sprouts + Super Bowl Spread! 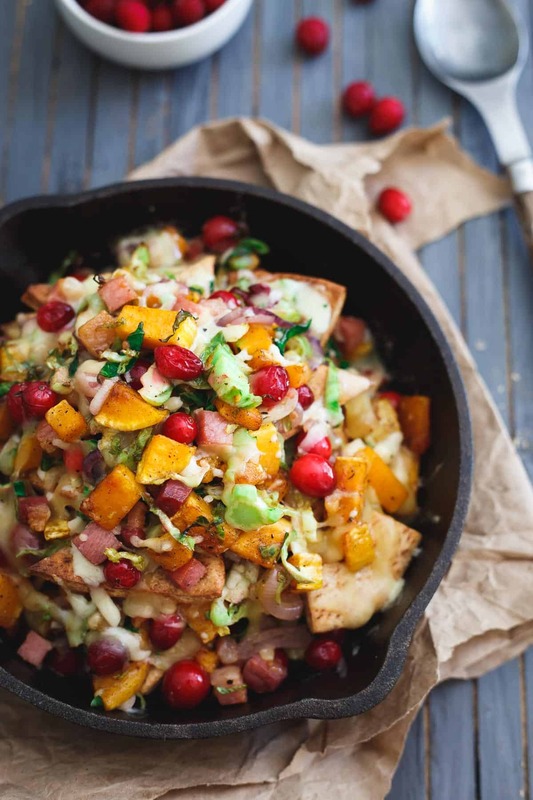 What an amazing Fall appetizer! I love all things butternut squash! 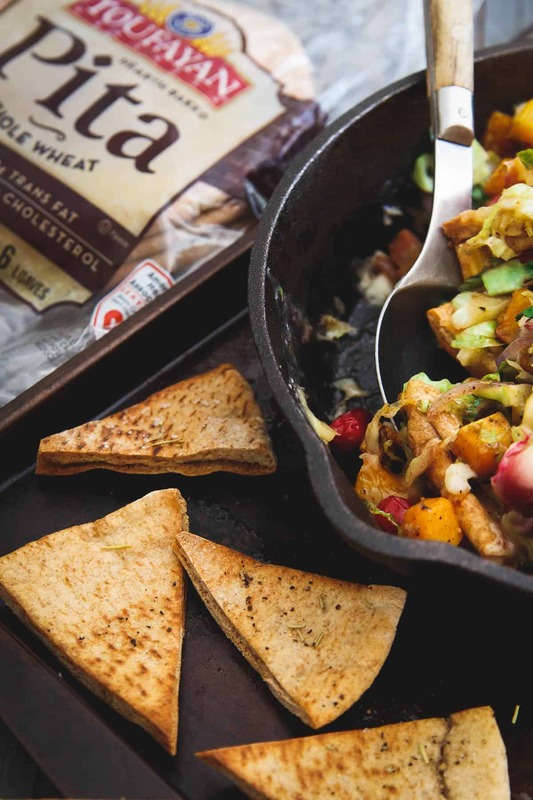 Oh my goodness Gina, these pita nachos sound absolutely perfect for fall. I love the flavors you’ve got goin’ here! And I totally get your fear with cutting the squash! Last fall I think I almost lost a finger or two trying to cut some acorn squash! The fear is real! Thanks for sharing and hope you have a wonderful week! Butternut squash…pitas…NACHO-FIED? These are seriously GLORIOUS. 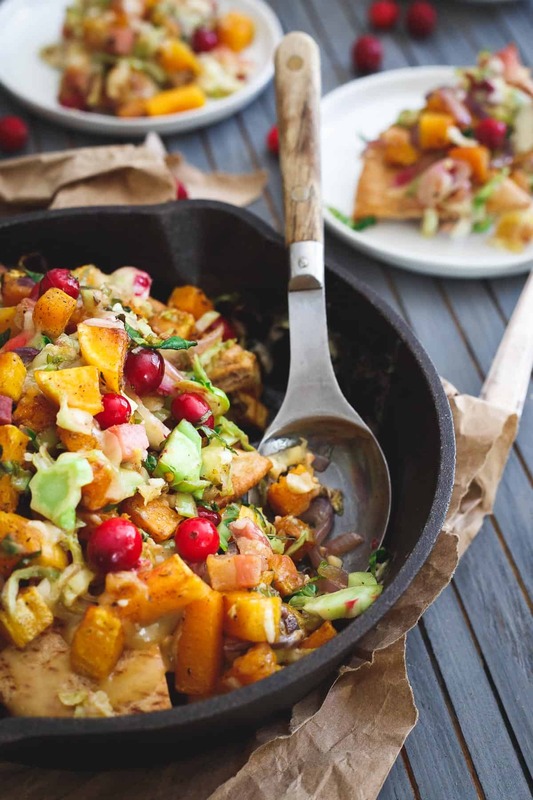 I am so happy it’s winter squash season, and these are happening ASAP.! Healthy nachos that look this good? I know what I want for the game tonight! You know, that might be worth it! I didn’t even think of that as an option! These nachos look amazing!!!! LOVE that you used Toufayan whole wheat pitas for the homemade chips!!! I’m all about anything NACHOS! This is such a creative idea for fall!! Do you deliver?? Literally all of my favorites! Pita – yes! 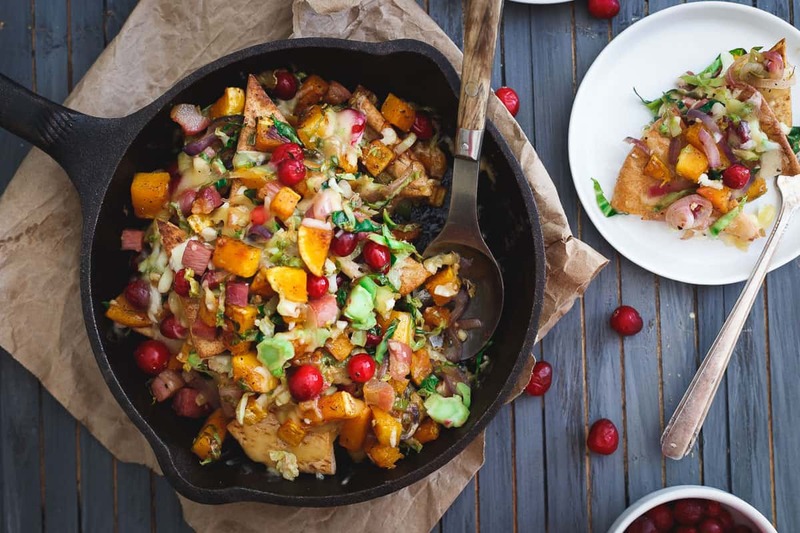 Butternut squash – yes! Nachos – HECK YESSSSS. Yes! Love everything about this. Everything. These nachos are EPIC! Literally drooling over these gorgeous pics! 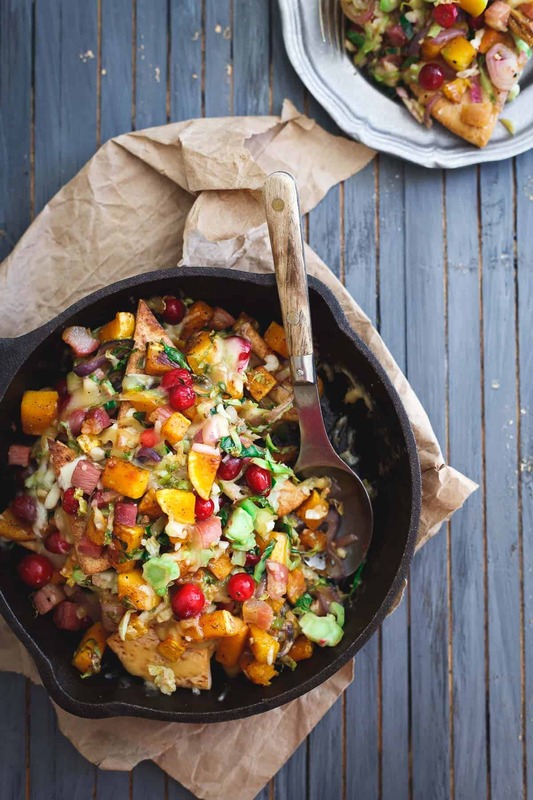 What more could you want than a large plate of fall-inspired nachos?? I have the same squash cutting fear. Glad to know I’m not alone. ??? ?